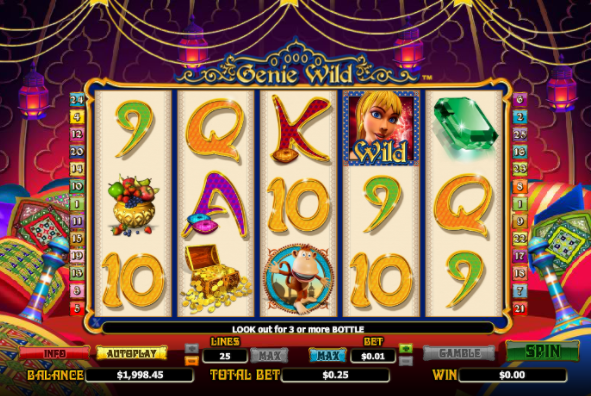 Take a trip on the magic flying carpet and visit the beautiful genie girl for a quest for this 5 reel online slots casino adventure. Your wish is her command which means endless free spins and bonus wilds are coming your way by playing your spins right while the genie herself watches on and helps generate you some incredible cash prizes. NextGen gaming is a game developer with over 20 years experience creating popular slot online games for all around the world. NextGen’s focus is to create games that deliver extraordinary entertainment and quality for their clients. They are are a firm favourite here at EasySlots online casino site. The company attracts players through their unique games, entertain their players through the games they offer and retain their players from the stimulation and fun each game provides so they come back time after time. This gaming developer lives up to its a name and is powering the future gaming industry. Have you ever wanted your own genie that can me all your dreams come true? Well, now you can with Genie Wild. 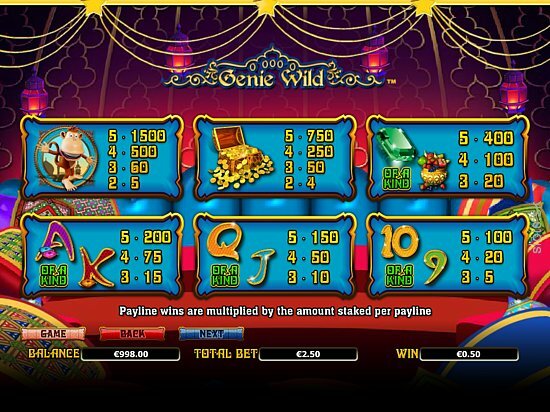 It is a 5-reel 25 pay line and comes with a Genie Wild Feature which can increase your winnings. Symbols in the game include a delightful bowl of delicious fruit, a shiny Emerald gemstone, a treasure chest packed with gold coins and a monkey. These are the higher value symbols in the game with the monkey being the highest paying symbol it will give you 1,500 coins if you collect 5 of them. The treasure chest is the second highest paying symbol and will reward you with 750 coins if you find 5 of them. The third highest symbol is the fruit and will offer you 400 coins if you find 5 of them. The wild symbol in the game is the main character – the Genie. She will substitute all other symbols in the game apart from the scatter symbol. The wild symbol has a lot to offer during the free spins round as she will expand across all of the reels and give you multiple wilds. The Genie’s bottle is the scatter symbol in the game. 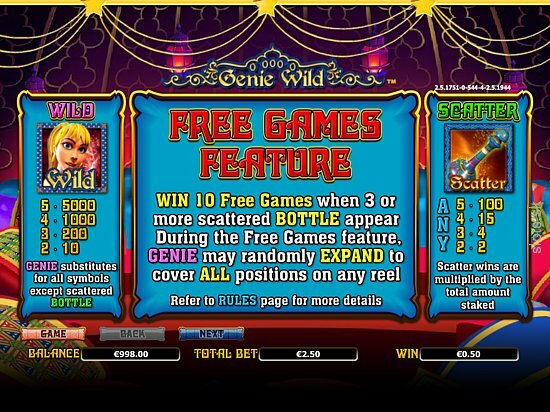 You can be rewarded with 10 free spins if you get 3 or more of the Genie Bottle scatter symbols. The Genie’s magical powers will be yours for the taking once she escapes from her bottle. As she fills up all the reels turning it wild you’ll be able to win even more winning combinations. 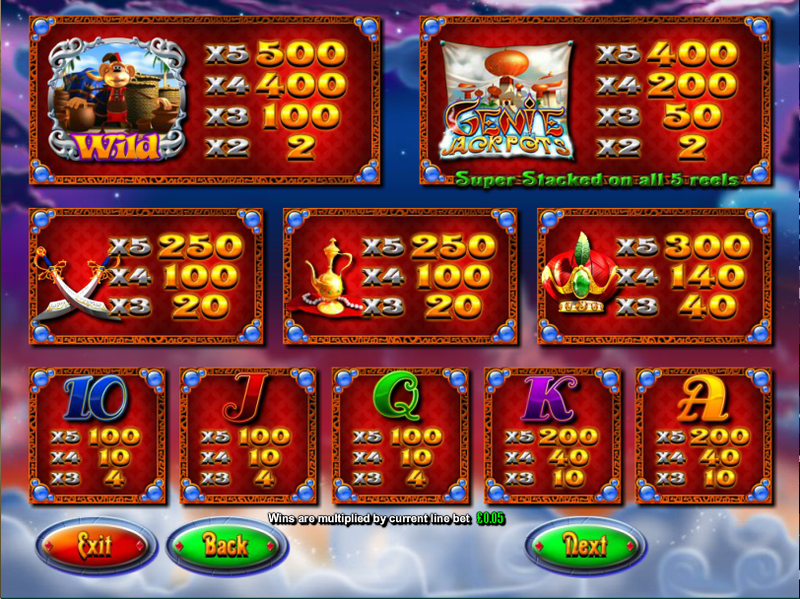 You will have to do your best in this round as the free spins feature can’t be re-triggered. The game also comes with a gamble feature to make the game that little bit more exciting. Whenever you get a win simply select the gamble button below the reels and you could double or even quadruple what you’ve already won. You can also double your winning by guessing the colour the card that is facing down, however, you could quadruple your winnings by guessing what the suit of the card is. The game has plenty to offer with some great features included it is worth giving the game a go. Along with a great design the games comes with a pleasant soundtrack which makes the game more enjoyable. The game is pretty straightforward to play but doesn’t hold back on entertainment and can become quite addictive after a few plays. Play here to get free slots with free spins!